Today I have a secret recipe for a traditional Italian vegetable soup served at Carrabba’s Italian Grill. Their minestrone soup is loaded with vegetables and beans. Full of flavor and good for you, this hearty soup is perfect for lunch or as a first course for your dinner. This recipe calls for Romano cheese rind. Normally you might throw away the cheese rind, but a great chef’s trick is to add the rind to soups. The rind will soften and the flavors of the cheese will infuse throughout the dish. In a 10 quart stock pot heat pot to medium heat and place butter and oil in pot. Sauté celery, onion, carrots and garlic and cook until soft about 5 minutes. Today’s secret recipe (shown below) is the perfect thing to enjoy on these never-ending cold days of Winter. This recipe for Carrabba’s minestrone soup is full of delicious vegetables and huge flavors. Once you taste this soup, you’ll never open another can of that bland store-bought minestrone. I like to double or triple the recipe and then freeze it in individual portions for easy enjoyment at a later date. The #1 Worst Food For Cellulite… AVOID THIS! At least 4 hours before cooking the soup, put the beans in a large bowl and add enough water to cover the bean by 2 inches. Let soak for at least 4 hours and up to 8 hours. (Or bring the beans and water to cover by 2 inches to a boil in a medium saucepan over high heat. Boil for 2 minutes. Remove from the heat, cover and let stand 1 hour.) Drain and rinse the beans. Cook the prosciutto and oil together in a soup pot over medium heat just until the prosciutto is lightly browned, about 3 minutes. Add the onion and leeks. Cook, stirring occasionally, until softened, about 3 minutes. Add the celery, carrots, garlic and oregano, and cook until the vegetables are beginning to soften, about 3 minutes more. Add the zucchini and cook until it begins to soften, about 3 minutes. 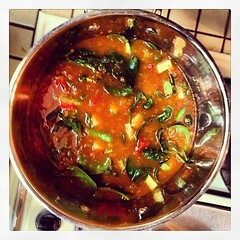 Add the tomatoes and their liquid and the tomato paste, bring to a boil and cook 3 minutes. Add the broth, the beans and their liquid, and the Parmesan rind. Bring to a boil. Reduce the heat to medium-low. Simmer until the flavors are blended, about 1 hour. Stir in the kale and cook until tender, about 5 minutes. Remove the Parmesan rind. Ladle into soup bowls, and top each serving with a spoonful of pesto and a drizzle of oil. Serve hot, with the grated Parmesan cheese passed at the table. 1) Learn How To Easily Make Your Own Wine. It’s been brutally cold here in New York. With temperatures only in the single digits, I’ve been keeping busy in the kitchen to stay warm. Today, I have a secret recipe for a delicious pizza served at Carrabba’s Italian Grill. Margherita pizza is an Italian classic that combines a few basic fresh ingredients to create a great-tasting pizza that will become a favorite in your household. Position a rack in the bottom third of the oven. Place baking stone on the rack and preheat the oven to 550°F, allowing at least 30 minutes to reach this temperature. Evenly sprinkle a pizza peel with semolina. Slide the pizza off the peel onto the stone. Close the door immediately and bake until the crust and the underside is browned (use the peel to lift the pizza and check), 8 to 10 minutes. Use the peel to remove the pizza from the oven and transfer to a carving board. Sprinkle with the basil. Let stand for 3 minutes Season with the pepper, if desired. Using a pizza wheel, cut the dough into wedges and serve hot. 2) Learn How To Easily Make Your Own Wine. 3) How To Get Free Food, Gas & More! Today’s secret recipe will show you how to make a delicious dish from Carrabba’s Italian Grill at home. Tag Pic Pac is short for Tagliarini with Picchi Pacchiu sauce and is a perfect meal to make on a busy weeknight. This pasta and sauce dish is made from scratch in very little time but tastes like you have been slaving over the stove for hours. To make the sauce, heat the oil and garlic together in a small skillet over medium-low heat just so the garlic is softened and the oil is very warm, about 5 minutes. Remove from the heat and let stand to infuse the oil, about 30 minutes. Pour the tomatoes and their juices into a bowl. Squeeze the tomatoes through your fingers until the are coarsely crushed. Stir in the garlic in its oil and the basil. Season with salt and pepper. Let stand for 1 to 2 hours for the flavors to marry. Bring a large pot of water to a boil over high heat. Add salt to taste. Add the Tagliarini and stir well to separate the strands. Cook according to the manufacturer’s directions until al dente. Return the tagliarini to its cooking pot. Add the sauce and mix well. Cover and let stand for 1 minute. Divide among 4 serving bowls and serve hot. 1) How To Get Free Food, Gas & More! 3) Learn How To Easily Make Your Own Wine.